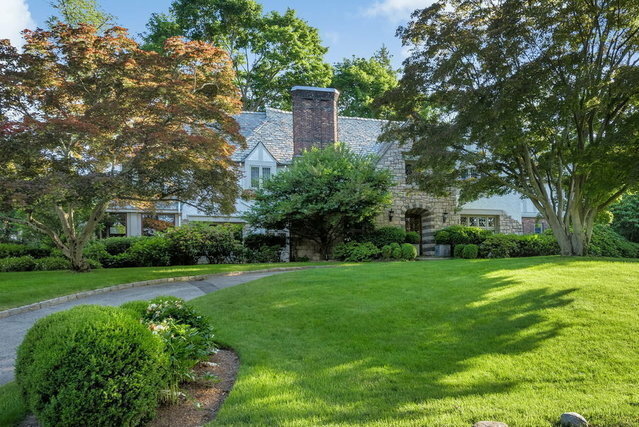 Set up on a beautifully landscaped corner lot in the grounds of the Westchester Country Club in Rye, this stone and stucco English-style residence is an enviable statement of understated elegance and sophistication. Flawless to every detail, the flowing floor plan creates an incomparable setting for luxury living and entertaining. A well-proportioned double-living room retains its important original details and features walls of book-end leaded glass windows, an ornately carved marble fireplace; and opens with a set of leaded glass doors, to an inviting screened porch with walls of tall single-pane window openings and a stone fireplace with upper media fittings. Opening out to a broad stone terrace, also with a fireplace, its a magical setting for large or small al fresco gatherings. The well-proportioned dining room with crown molding and wall of leaded glass windows has the extra flair for perfect entertaining. For family-style gatherings or entertaining in relaxed-style, a bespoke kitchen with top-grade appliances, glass-front cabinetry, a center-island, a sun-lit breakfast area; and a family room with custom cabinetry centered fireplace opening to the level lawn surrounded by gorgeous gardens. Creating a perfect environment for everyone, the private quarters features four bedrooms, one with hall bath and two with a tandem bath, plus additional nursery bedroom or office, all beautifully updated. A spacious master suite features dual fitted dressing closets and a spacious bath with dual vanities, a glass-enclosed steam shower, water closet, and a carved Carrera marble soaking tub that redefines luxury. A true statement of elegance and sophistication, this unsurpassed setting is moments to every convenience, and a 32 minute train ride to Manhattan.